I'm about to upset some people here. but i wouldn't touch EBC brakes pads even if it was a last resort. I'd rather have the car off the road until a decent set of pads could be delivered. My opinion is to call QFM and explain the situation to them, That way you'll end with good advice and a good pad. Leave the EBC crap to the rice boy wankers. Top stuff Steve and welcome to fm. Very detailed and informative Steve. For the $$ you pay for EBC, there is better stuff to be had in the same price bracket. which pads would you recommend in price range better than EBC? I have bendix general pads on with dba slotted rotors, don't have any build up on the rotor but do need some new pads now. Was leaning towards the EBC or Bendix heavy duty/ultimate? Any others? Contact Race Brakes in Yarraville, Melbourne. I'm pretty sure they have their RB24 compound in standard B-series pads now. Excellent pad. Low dust, very grippy, doesnt eat discs and is pretty reasonably priced. But as usual it always comes down to price. What would I expect to pay for ebc greenstuff or bendix ultimates? Thanks Steve, yes I have no intention of just changing the pads, and I'm fairly sure i can machine the rotors one more time. They have been machined twice before and both times they were only lightly skimmed. I will need to measure them up. For now I have my old Ford rotors in until I get the DBAs looked at on monday. Some ways to help with rotor's and pads is when at a set of traffic lights stop a couple car lengths and creep slowly forward, so then u will have less warping issues and heat is not on 1 spot for a long time. Always try and cool brakes down for last 5 kms home by going easy on them as heat damages these parts quick. Yep, i think i need a better setup too! I have standard rotors and bendix heavy duty all round atm. I plan on getting some slotted and cross drilled + EBC green sutff's for the front, ive had them once before on my AU and they were awesome. What setup are you using? QFM better pad for cheaper price. Some ways to help with rotor's and pads is when at a set of traffic lights stop a couple car lengths and creep slowly forward,so then u will have less warping issues and heat is not on 1 spot for a long time. Ahhh that explains drivers in their lil lancers and camrys and for reasons unknown to me they brake early and have a car to 2 car lengths of room in front of em at the lights. Well the RTA do suggest u to keep a full car length from another at a set of traffic lights, so I take 2 and creep forward and help my brakes last. I'm using RDA's and they seem to handle pretty good for el-chepo. doesn't shudder like the others that depends on optimal operating temp, it's an all rounder OME product and its balanced for the way I drive. Hey tickford, what are those QFM pads like with maximum load carrying? QFM have a range of different pad compounds to suit different driving conditions, and if they don't stock or never made your pad in a particular compound they will custom make them for you. When you look at at an RDA pad you'll see it will have chamfers on the leading and trailing edges they also have a groove cut from top to bottom in the middle of the pad, they started doing that to combat noise. QFM don't have any of that and still don't suffer from noise. Hard to tell on mine because the mags are charcoal, gets wash once in a blue moon due to the constant raining to make it worthwhile to admire the shiny glossy clear on the wheel, but I can see what you mean, they do look a lot duller at the front wheels. Might look into those QFM. 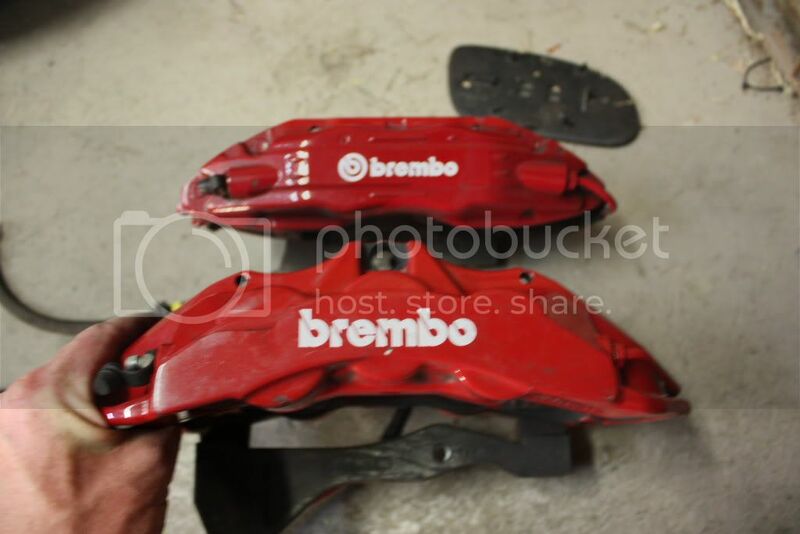 6 pot front, 4 pot rear with Race Brakes RB24 pads.